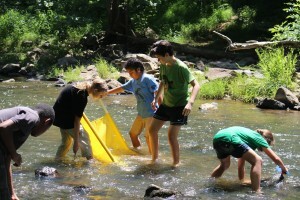 iWalk the Eno Science & Nature Summer Camp helps children learn & grow in nature’s classroom. The camp is located in Orange and Durham counties at Eno River State Park and West Point on the Eno City Park. The parks offer many opportunities to camp, hike, & splash in a natural wonderland. Our program offers a fun, discovery-focused experiential learning program. We place an emphasis on helping kids develop skills in science, respect for each other and the natural environment, and confidence in getting out & asking their own questions. If your child is ages 8-12, please apply today for iWalk the Eno Summer Camp! 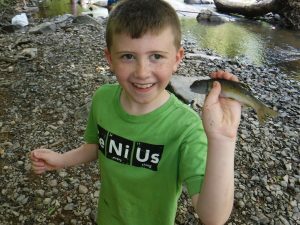 iWalk camp has lots of time outdoors, exploring nature, doing science, and becoming an Eno River State Park Junior Ranger. Click below for a 2019 iWalk the Eno Camp Application or call (919) 620-9099, x 204 to receive an application by mail. Applications taken through April 30, 2019. Scholarship information– Full and partial scholarships are given based on income. Any child qualifying for the federal free or reduced lunch program qualifies for a full or half scholarship respectively. Contact us if there are other circumstances that we may consider for scholarship need. After you register for iWalk, a confirmation e-mail will come with a link to the scholarship application. A $20 per week application fee is still required to reserve your space in camp. On the iWalk application payment, select pay in installments and pay $20 per week per camper. Upon receiving the confirmation e-mail, open the scholarship link and complete that application. Are you enrolled in iWalk? A confirmation packet will be sent to your home address with drop off information and a packing list in May. If you do not receive yours please e-mail iwalktheeno@enoriver.org or call (919)620-9099 ext. 204. Educators – Teacher positions are filled for summer 2019. Are you a K-8 teacher in NC? iWalk the Eno Science and Nature Camp hires educators to work one or both (preferred) sessions and pays competitive wages. 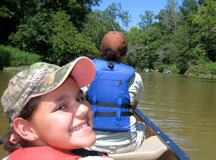 Email iwalk@enoriver.org for an application to work at a great camp in the great outdoors! iWalk the Eno has opportunities for middle school students to join our staff as volunteer Junior Mentors and for high school students to work as Mentors (camp counselors.) A limited number of positions are open each summer, and preference is given to former iWalk campers or those with equivalent experience at camp and on the Eno. Please email iwalk@enoriver.org or call Dave at 919-620-9099, x204 to receive an application. Application deadline for mentors: March 14, 2019. Registration opens February 1. All questions in the application are in English and Spanish. Registro abre 1 Febrero. Todos preguntas en el solicitud son en Español y Ingles. 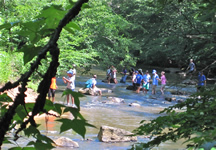 Application Deadline for campers is April 30.
iWalk the Eno is supported through major funding from the Burroughs Wellcome Fund.